A lot of people I meet completely under estimate the amount of time I spend alone each day. Somehow the title of PHOTOGRAPHER sounds so glamorous. I like to think that's true :) but quite honestly on the days when my office staff is off the only interaction I have is with the UPS driver and my cats! During the winter months this is especially true as the snow covered roads just don't seem to scream "let's schedule a photo shoot!" So Kudos to Tracy & Todd for thinking outside the box. 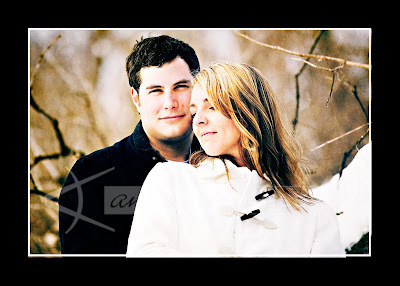 I met this adorable couple at Tracy's parents home, the exact spot where their ceremony will take place this summer. As we trudged through the deep snow of their beautifully wooded acreage Tracy ever so sweetly apologized for asking me to wear my snow shoes and trudge to the ends of the earth for their photos. I guess I was cursing under my breath a bit more loudly then I thought! No seriously though... she couldn't have possibly understood how wonderful it was to be out shooting again. This was my first session since taking my medical leave and it felt exhilarating to be out on assignment again... not to mention the fact that the location they choose was gorgeous. 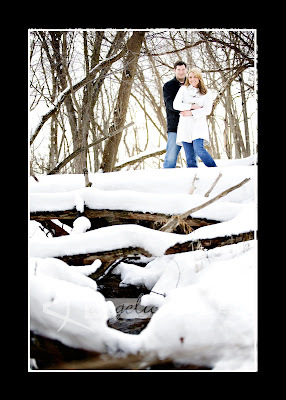 Tracy & Todd thank you for braving the cold with me on Friday. I can't wait to come back this summer for your beautiful backyard wedding! plus just look at these two... so adorable.